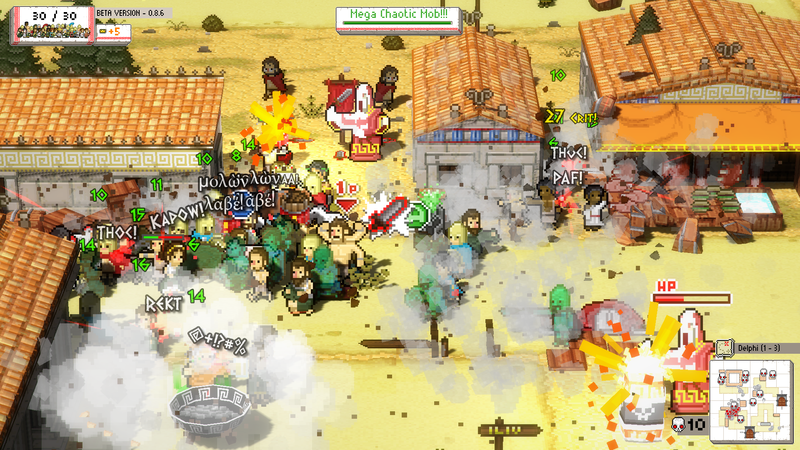 Okhlos is organised chaos at its best. The challenge level may provide moments of frustration, leading to multiple viewings of initial areas, but it’s easy to lose hours of time from the determination to send every God back to Olympus, where they belong. Learning about the gods of Greek mythology has always made me feel like I’m witnessing a fantastical soap opera. Constantly bickering and trying to one-up each other through their powers, they often lead the human race unwittingly into the fray. They may come to regret stomping through one Philosopher’s seminar however, as he seeks revenge in the form of a mob big enough to take down the residence of Olympus. That is how rogue-lite riot simulator Okhlos begins. After the story introduction played out, I was taken through the quick tutorial. Don’t be fooled by how short it is, as the controls are hard to master, if easy to learn initially. You have two things to think about: the actions of the mob, and the movement of the leader. Since the Philosopher refuses to get their hands dirty, they must be controlled separately from the group. Controls-wise, this translates to moving the leader with one stick of the controller and the mob with the other. The mob can’t go far without the Philosopher, who tells them when to attack, defend, come together, or split up (using the triggers and bumpers). Keeping an eye on where the leader is at all times among the chaos can take a while to get used to. 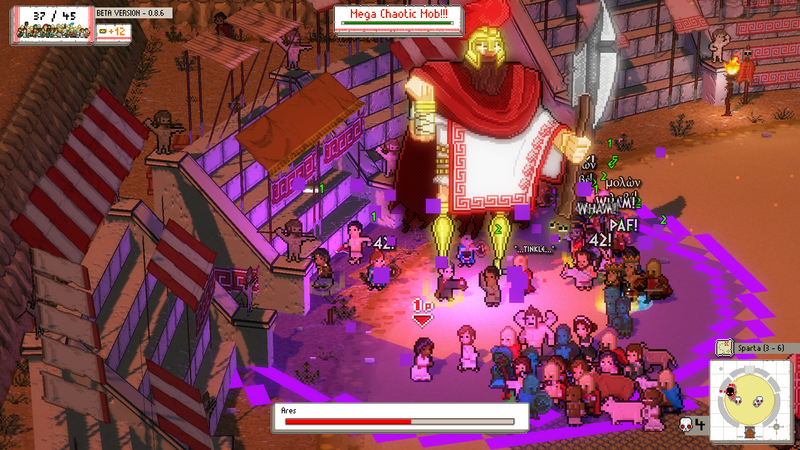 Okhlos helps out by having most enemies make a bee-line for the leader, forcing you to get used to hurrying them out of harms way, while simultaneously moving in with the mob for clean-up duty. I finally managed to get used to this movement by around my third run, by which time I didn’t have to think about it anymore. The mob isn’t just made up of random people, but is formed of varying classes that bring different stats to the group. There are Philosophers (potential leaders if your current one dies), Citizens (basic grunts), Warriors (high attack), Defenders (high defense), Slaves (can pick up items), Heroes (add abilities or stat boosts) and Animals (only useful for trade) to choose from that are scattered around each stage. Because there are so many characters fighting at once, you only feel the effects of the class types if you have a lot, or too little, of one particular group. Take Slaves for example; having a lot of them means an advantage over items (health, brief attack boost, bombs etc) that can really help in a pinch. Only owning 1 or 2 could then leave me with no way of storing up items for a boss, and I tended to really need those health pick-ups. One of the most satisfying things about a good run was the ability to increase the size of my mob and fill the game screen with an army of chaos. Boosting size and efficiency helps to tear down buildings, and grab any items left behind. The more the mob crushes in its wake, the bigger the objects they’re able to destroy, shown via a meter at the top of the screen. Pause in your rampage for too long, and not only will you get weaker, but it can go so far as to make your members depressed and start to leave — I’m sensing an open invitation to cause copious amounts of mayhem. 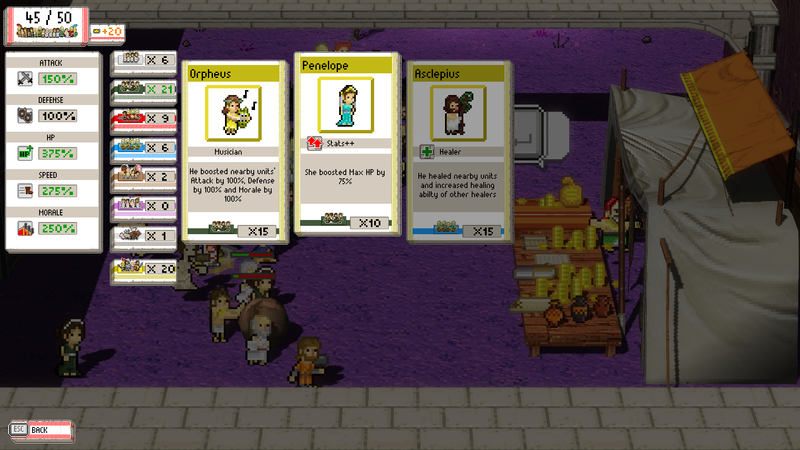 In a break from the chaos, Okhlos provides shops where I could trade current mob units for newer shiny ones. It could be a simple swap between Warriors and Citizens, but what I always hoped for was to trade for Heroes, as they added some much-needed power. These came in two categories: Rulers — with impressive abilities (such as Drakularos healing the mob a little for every kill they perform), and Stats — that give boosts (like Oedipus, who adds 25% to defense and moral). I needed all the Heroes I could get, as the further into Okhlos‘ eight-world battle I got, the more hoards of cyclops, nymphs and harpies were awaiting my arrival. The biggest challenges by far were the gods themselves, ominously towering over the mob with their huge, imposing designs. What was especially clever was the way their move sets were representative of their known abilities, such as Apollo (god of music, truth, and healing) raining down arrows while healing himself, and Ares (god of war) coming with a side order of two mini-bosses while wielding his own fearful ax. It has to be said that some of the later boss fights actually ended up being kind of frustrating. Aphrodite (goddess of beauty and love) was a particular bugbear of mine, and whenever she turned up I always met her with a sad sigh. Let’s just say her abilities — which include teleporting, summoning lots of monsters and charming members of my mob to fight against me — were extremely difficult to counter. Being utterly crushed by a god could make it hard to summon the courage to start from the beginning again. 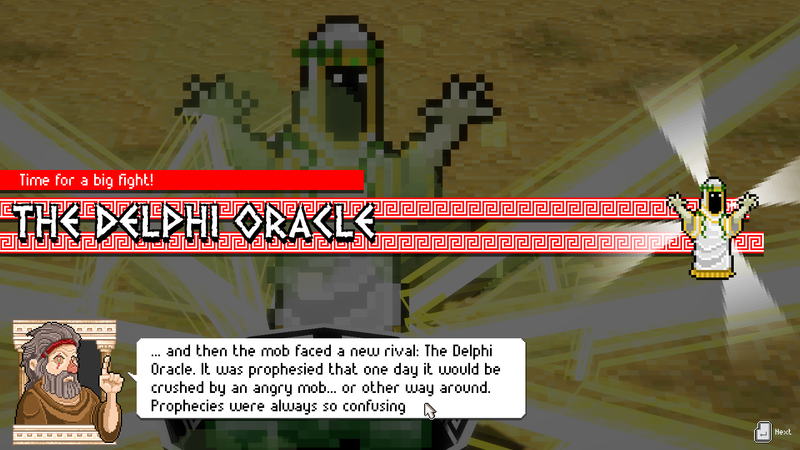 The first few stages started to look very repetitive, while Okhlos‘ reliance on luck wasn’t helping matters. A lot hangs on the unit exchange shops, and whether you get offered Heroes or not. Being given a bad hand in this regard is really annoying, as they can be pretty key to success. Trying to combat problems with repetition and difficulty are in-game achievements that reward the player with new Philosophers and Heroes to start a run with. These provide helpful attributes such as being able to break buildings with more ease, secret items being shown on the map, and having enemies frequently drop items. Not only does this help to change up the gameplay a little, but sets you off at the beginning of a run feeling like you have more of a fighting chance. There are clearly a couple of elements dragging Okhlos down, what with the controls needing a bit of brain power, and certain bosses leaving me stumped, resulting in repeated sightings of early areas. The majority of the game is really delightful though, with its fun core gameplay wrapped in mythologically-themed packaging that provides a great excuse for some good ol’ ancient humor. This review is based off a PC copy of the game, which we were provided with.